The last thing our Lord Jesus said before leaving earth was, "Go into all the world and make disciples." 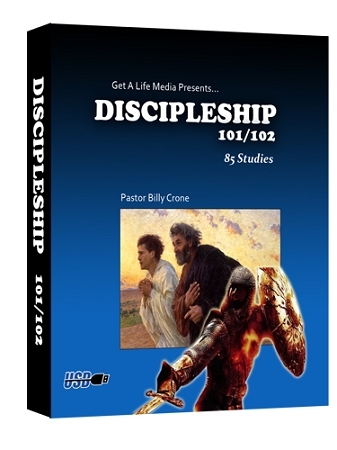 Disciples is the Greek word "mathetes" and it means, "disciplined learner". Therefore, it's obvious that our Lord Jesus wanted all of His followers, not just the twelve disciples, to become disciplined learners. Unfortunately, we're not. If you look at most Churches and Christians today, it doesn't look like we're learning all we can about our Lord Jesus Christ. Rather it looks like we're learning all we can about anything and everything but Jesus Christ! Therefore, this Discipleship Series seeks to begin the process of spiritual maturity that should have begun at the moment of salvation. 101 - Salvation, Assurance, Daily Time with God, Prayer Life, Personal Bible Study, Scripture Memorization, Confession of Sin, Dealing with Temptation, the Spirit-Filled Life, Obedience, God's Discipline, Developing Godly Habits of Living, Knowing God's Will, Stewardship and The Church. 102 - Inspiration & Inerrancy, Bible Interpretation, The Trinity, The Deity of Christ, Salvation, Sanctification, satan & demons, Future Events, Systemized Bible Study, Evidences For The Christian Faith, Biblical Family Values, The Role of the Man, Husband and Father, The Role of the Woman, Wife and Mother, and finally, The Role of the Children.